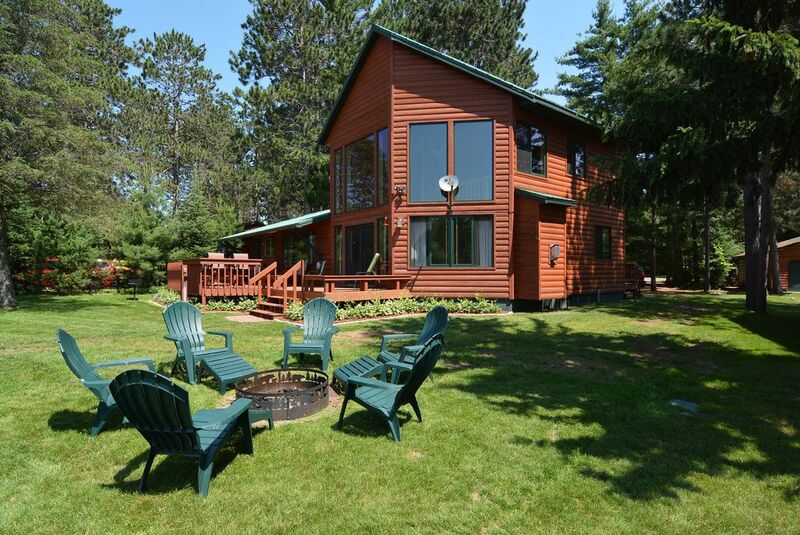 4 Bedroom Chippewa Flowage Vacation Home Rental in Hayward, Wisconsin! The North Star vacation rental is a comfortable 4 bedroom rental home on the scenic Lake Chippewa Flowage outside Hayward, Wisconsin in central Sawyer County in Northwest Wisconsin! The North Star vacation home rental features an open living room, four bedrooms, modern kitchen and lakeside deck. The floor-to-ceiling windows in the living room capture both the warmth of the afternoon sun and the beauty of the night sky. The windows help frame a classic Northwood's panorama of trees, water, green grass and sky all from the nicely furnished living room where you can curl up in front of the gas fireplace. The carpeted living room also contains Satellite TV, DVD player, Internet access, ceiling fan and a queen-size sofa sleeper. Above the living room is a loft bedroom suite that opens up to a balcony overlooking the Chippewa Flowage shoreline. This bedroom suite includes a queen bed, ceiling fan, closet and full bath. In addition to the loft bedroom suite, there are three more bedrooms on the main level. Two of the bedrooms have 2 full beds each and the third bedroom has a set of bunk beds in it. All bedrooms have ceiling fans and dressers. The dining area and kitchen offer plenty of space to prepare and enjoy meals. The dining table sits 10 people while the modern, clean kitchen is outfitted with all the essentials including dishwasher, microwave, coffeemaker, toaster, refrigerator and stove/oven. There is a second full bath and laundry room with washer/dryer off the kitchen. The deck is easily accessed from both the kitchen area and the living room and includes built-in bench seats; picnic table and gas grill for your enjoyment. The large, level yard includes a fire ring and opens up to 200 feet of shoreline and a dock. The North Star vacation home rental offers an ideal gateway to the Chippewa Flowage ("Big Chip") – Wisconsin's 3rd largest lake! Located in central Sawyer County in Northwest Wisconsin only miles from popular Hayward, WI, the Chippewa Flowage offers over 15,000 acres of high-quality recreation! Dotted with 200 undeveloped islands; 233 miles of largely undeveloped shoreline; irregular, wooded lakeshore; bays, floating bogs and channels, the Chippewa Flowage is highly regarded for its natural scenery and fishing. Some of the islands have sandy beaches and clear water swimming opportunities. The Chippewa Flowage is a premier musky lake and also offers excellent walleye, crappie and bluegill fishing. The wild character and uncrowded waters are also home to bald eagles, ospreys and loon. The 4 bedroom North Star can be combined with the 2 bedroom #104 Little Dipper cabin rental next door to make a great group or multi-family 6 bedroom vacation getaway on the Chippewa Flowage capable of accommodating up to 16 guests! Add on the LIttle Dipper for only $600 for the week! Everything was clean and in good condition. Enjoyed our stay, (would have liked to catch more fish lol) had a lots of fun and the staff who supplied us with our needs, and were very accommodating. Thank you for opening your house to us to have a wonderful family vacation. This home is very clean and has everything you need. If you run out of something they usually have it. Located on a dead end street. Very quiet area. Great area for short walks. Love the backyard and fire pit. The only issue we had was the water. Bring lots of jugs of water if renting this house. Otherwise a great family rental. We rented both North Star and the smaller cabin Little dipper for a multi family trip. It worked out wonderful! Both places were very nice! We loved the house and our big group could all eat together at the dinner table every night. Everything was very clean and well maintained. The yard and dock were very well maintained. Enjoyed our evening campfires and the peacefulness of our area. We had no problem with anything and we are looking forward to planning our next trip!! Love this place! Our stay in the Northstar was great. This house works well for our family. We also needed to rent the small cabin next door, the Little Dipper. This cabin is not nearly as updated. No air conditioner and the shower was a joke. If you tried taking a shower the water ran out from under the base as fast as the water came out if the shower head. A plumber did come on the first day but said it was not a thing he could fix. It was a construction problem. He said go next door and shower!! Not what we wanted to do. So bring lots of towels if your staying there, you will need them to clean up all the water!!!!! Plenty of beds for a large group and the lawn is expansive. Kitchen is well-equipped to handle all your cooking needs. Family room is a little tight but we spent most of our time outdoors - and the yard is perfect for plenty of outdoor fun. Positives: 7 comfortable beds, large deck and lawn, large boat dock, massive dining table. Negatives: dishwasher could use an upgrade, family room seating is limited, firepit hasn't been used yet this year.